Some clients are happy to leave the design of their website to us, while others come with firm ideas about what they want - and don't want. The Complete Set - a loose collection of Brighton-based musicians who meet, record and play intermittently - had a very clear sense of what the site needed to look like and provided a selection of remarkable photographs that we collaged and then turned responsive, so that they worked well on mobile devices. 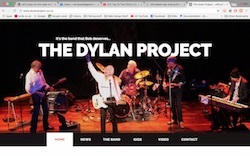 We added a News page so that the band could add news - new recordings, 'tours', and other musings - whenever they liked and a Band page with links to their Soundcloud presence. The result is quite unlike anything we've built before. 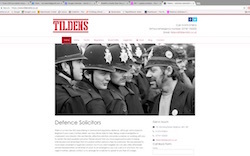 We've just finished a new website for a Brighton-based solicitor specialising in criminal defence - Tildens Ltd. The site incorporates a bespoke content management system (CMS) which allows the client to change the text on many of the pages along with the list of costs for individual services; there's also a full-featured blog which feeds the latest posts to the front page of the site. What made this site really fun to do was the client's visual sense. Each page is topped by a classic photo from the 50s, 60s or 70s, showing either recognisable public figures (yes, that is Mick Jagger) or memorable scenes from the news that many visitors will remember - for example, the scene from the miner's strike on the home page. The brief was to keep the site clean, use a minimal colour scheme, add multiple contact forms, plus buttons so that visitors can contact the company using Facebook Messenger or WhatsApp on their smartphones. 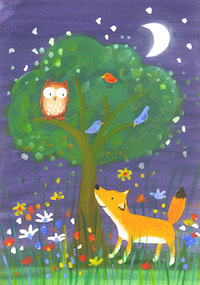 We've just finished a new website for children' book illustrator Emily Bolam and it was a treat from start to finish. Emily came to us with a clear idea of what she wanted from the site and some references from other websites so we could get a good visual feel of what she was looking for. 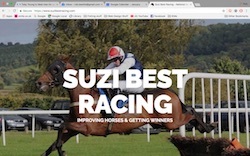 As with any website where the visuals are the star attraction, we felt it was the job of the design to get out of the way, so decided to keep things as simple as possible - nice tidy sans serif body and navigation and a hand-drawn Google font for the main title. The rollovers on the front page disappear on tablets and smartphones, but the galleries work well across all devices - visitors can use a mouse or trackpad on their computer and simply swipe from side to side if they're using a touchscreen device. Thanks to Emily's organisation and enthusiasm, the whole thing was completed within a week of her first getting in touch. This is a great example of how you can save money on a website if you're organised and prepared to respond quickly as new versions of the site are uploaded. When we build a new website for a client, we insist that they register the domain - that's the 'www' bit - themselves; that way not only do they retain control over the domain for as long as they continue to renew it, but it's also their responsibility to make sure it's renewed in a timely fashion. 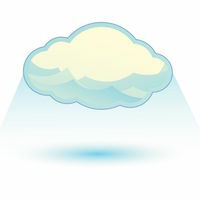 We do offer hosting and support however, using fast SSD-based servers located in the US that include the increasingly important (and Google-friendly) SSL certificate as standard, as well as the latest compression techniques to ensure that your site performs snappily when visitors come calling. That's why our heart sinks when a client tells us that they've purchased hosting along with their domain name "because it was a good deal." Often, these "good deals" are based on using the domain registration company's own website builder - a glass half-full way of building a website yourself in a browser using a limited palette of templates and design tools. This kind of hosting is useless for the kind of website that we build - where we require full access to all the nuts and bolts in order the get the site humming along nicely; which means you've wasted your money. There are good, inexpensive hosts out there and we're always happy to work with them. Just bear in mind that whatever hosting you choose, the chances are you'll need support of some description over the 12 months that follow, so take some time to make sure that the good deal you think you're getting is actually a good deal. And if in doubt, always check with us first. We have a list of hosts we've worked with before that meet the minimum requirements for hosting a professional website - better to be safe than sorry. We love services like Flickr and YouTube and Vimeo because they take the heavy lifting away from our own websites - handling both the storage of stuff that takes up a lot of space and the bandwidth required to serve it up to visitors. But you can come a cropper when titans like Twitter or even mini-behemoths like Tumblr change the way they allow third parties like us to access their information. This is why Twitter widgets suddenly stop working, or blogs hosted on Tumblr refuse to show up without warning. Putting your precious eggs into someone else's basket has advantages - usually in terms of cost because you save on hosting - but there are disadvantages too, mainly because you're no longer in charge of looking after your own data. And whether that data is pixels in a photo, frames in a video, words on a blog or zeroes and ones on an MP3 track, you may want to think about balancing the cost savings against retaining control over the content that you've created so lovingly. The key with this new business to business website was to match the company's existing, related site. As an established buyer and seller of businesses in the UK it was important that the new site matched the livery and style of the other site. We used the free-form Foundation framework to match the existing site in lots of different ways but softened the overlays and panels by introducing subtle corners to each one. We mimicked the fonts closely as well, in order to deliver a looked-for 'family feel' so that the site would immediately feel as if it came from the same stable. 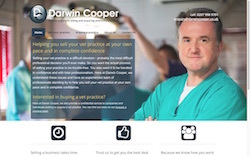 In terms of copy, we went for slightly more casual, friendly tone of voice, since the business at hand is often a very personal matter - a vocation more than just another job - and the client wanted to communicate clearly how well the company understands the specific needs of the veterinarian community. 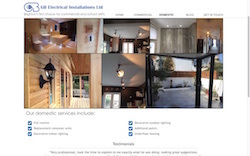 When Geoff at GB Electrical Installations Ltd came to us he already had a website but felt it didn't reflect the nature of his business as well as it should. The site was too wordy, difficult to navigate and placed too much emphasis on the domestic side of the business, whereas in fact, the company does mainly commercial work - mostly in schools and larger firms. We kept some of the look and feel of the existing site - horizontal navigation, same logo (though re-done in a more modern, flat style) and a similar colour scheme, but opened the design up, made it properly responsive - so it works well on smaller devices like mobile phones and tablets - and added some funky masonry portfolios which are able to incorporate photos of different shapes and sizes. The result is a slick, simple, easy to navigate modern website which didn't cost the earth. 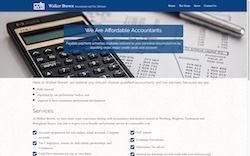 We've just finished a complete re-design of a website for Walker Brown, a firm of accountants based in Southwick but serving Brighton, Worthing and the rest of Sussex. The company had run their own website for a while using an online website builder, but had discovered that it didn't allow them to produce something that looked good, got their message across and was mobile-friendly. We used the Foundation framework as the basis for the site, added a simple slider with some compelling message text animated on top and then linked the site to a specially created Tumblr blog. In addition we added a small, friendly content management system that allows the company to add useful links to go alongside the blog in the sidebar. The whole site was delivered on time and to budget. 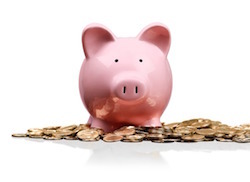 Want to save money on a website? Of course you do. Everyone does. That's why we give you an estimate at the beginning of the process and do our level best to stick to it. Now, whatever people may think, web development is an unpredictable science and various technical gotchas can lay in wait along the way, which may result in us having to spend more time on this or that than we'd originally anticipated. This isn't helped by web technologies that are constantly changing and - sometimes anyway - evolving. That's because even when it turns out to be a change for the better, everything on a website tends to depend on everything else - and if you change the notches on the belt, the trousers may fall down. But what clients don't often realise is how much they can affect the final bill - how much control they can exert over what they end up paying. We're not going to name names, for obvious reasons but let's take two examples at opposite ends of the spectrum. * client one has a firm idea of the new web site's purpose; they have the pictures and most of the text; they're routinely available by email; they make decisions quickly (not hastily, there's a difference) and they're engaged in the project. Result? The website comes in on time an bang on budget. No nasty surprises. * client two has a firm idea of web site's purpose too - they've even got a written spec; but they change their mind a lot; they know what they don't like but are less certain of what they do; most significantly, they're completely blocked and unable to deliver any content at all; the site has now been in 'development' for a record 18 months. It won't come in on budget. Over the next couple of blogs we're going to suggest some ways that you - as a client - can help us to ensure that a website comes in on budget. See you then. Hamish MacGillivray, a freelance exhibitions project manager came to us because his existing website was too fragmented and disorganised; he had plenty of material and a good story to tell but it just needed knocking into shape and incorporating into a new, responsive design. Hamish is a great user of notebooks so we found a theme which echoed this and used it as the basis for the site. The front page is a blog powered by Tumblr, while his CV is presented in the form of an innovative timeline. The website build went quickly and easily and on-budget, at least in part because Hamish had all the materials he wanted to use pretty much ready to go; and as the site developed he was very good at providing feedback so we both knew we were moving in the right direction. 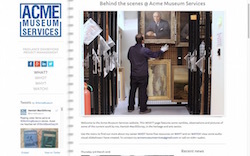 Here's a link to the new Acme Museum Services website. 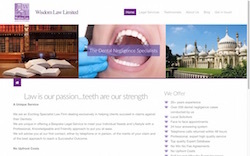 Wisdomlaw is a solicitor based in Hove which specialises in dental negligence claims. Since it's probably not a good idea to show images of dental disasters it was important to get across the three main planks of the company's offering as quickly as possible - hence the banner photo montage showing a library, an open mouth and Brighton Pavilion; this establishes the company as authoritative, local and tells visitors very clearly that the service is associated with dentistry. 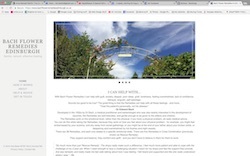 The centrepiece of the site is a relatively complex form which allows visitors to provide the background to their potential claim and which is designed to respond with an automatic email outlining the next steps. 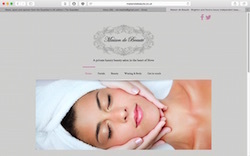 Just before Christmas we finished another new website, this time for Maison de Beauté, an exclusive beauty salon right here in Hove. The brief was to create something simple that matched the brand's existing marketing materials - especially the printed brochure which gets handed out to clients and prospective clients. We used the Elite theme as well as a great little price list stack which performs really well on small devices - there are a lot of prices on this site. The client chose photographs from iStock but going forward hopes to get personalised shots of actual clients to use on the site. The result is a professional-level site, produced on a budget in less than a week from start to finish. Sometimes these short jobs are among our favourites because you're able to really concentrate on the getting things done, making design decisions quickly and still delivering a great website. 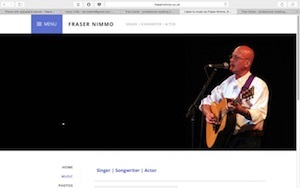 We've just completed a complete overhaul of Fraser Nimmo's website. 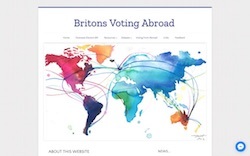 This Scottish singer, songwriter and actor came to us with a brief to modernise his original site, to make it more expansive, while preserving the majority of the content. And of course, to make it responsive so that it works well across all devices and won't be ignored by Google if someone searches for it on a smartphone or tablet. We used the Strata theme from Nick Cates Design - the first time we've used one of Nick's themes in a while - and were impressed at how easy to use and flexible it was; and how light on its feet. At a time when some themes seem over-burdened with 'stuff' to the detriment of their overall performance, Strata is a positive midget and damn well flies along. Elsewhere we used Doobox' Montage stack for the gallery and Yuzool's Cart stack for the online shop - still the nicest, simplest implementation of a Paypal shop we've seen. 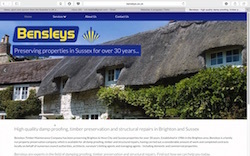 We've just completed a new website for Brighton-based Bensleys Timber Maintenance. 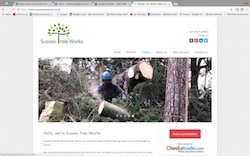 The brief was to produce a modern, responsive website that emphasised the benefits of looking after all aspects of timber in your house, while demonstrating Bensleys' experience and technical expertise. We used a series of thumbnails and light boxes to show different forms of damp proofing, treatment and timber maintenance in action and the client provided all the technical details for the associated captions. We used simple candid snaps of the three principals to emphasise the friendly, family nature of the company and how it prides itself on personal service. We used the Boutique theme from Themeflood for this site, together with the Masonry stack from Seydesign and the Hunter stack from Doobox. 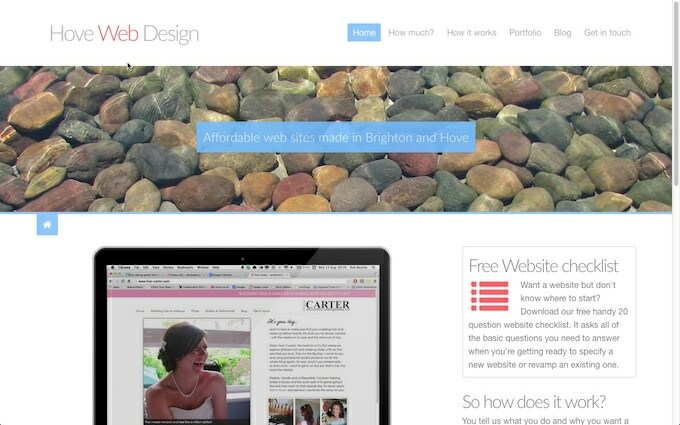 We've been building sites using Rapidweaver, a program created in our home city of Brighton & Hove for years now and we love using it. Rapidweaver is at the centre of a thriving development community and every week new themes, plugins and stacks are released that make the sites we build with it faster and funkier. But there's no getting away from the fact that lots of customers and potential customers ask whether we can make them a site using WordPress - and pretty soon the answer will be 'yes'. 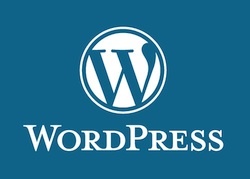 What's WordPress? It's a CMS or content management system and despite coming from a company that only employs a couple of hundred people, it's the power behind 75m websites worldwide. That's a lot of websites. A lot of websites. We're not turning our back on Rapidweaver - far from it - but we'll be coming up with a range of WordPress offerings to suit every budget and every kind of website. More news when we've got it. For a while now we've offered clients the ability to update the content of their website without having to keep coming back to us for help. This is known as a Content Management System - CMS for short - and is a good, cost-effective solution for customers who need to update parts of their site regularly - perhaps to list special offers or new services. We're now pleased to offer a brand new, much more powerful way to manage your content, using our own customised CMS that makes it easier than ever to change text and photos, add video or even create custom slideshows. There are some simple rules of the road to follow but all you really need is a web browser and a bit of confidence and you'll be away in no time. Of course, not everyone needs a CMS. In fact most people only change the content of their site once or twice a year. If that's the case, we're more than happy to help out. Although blogs are a great way to add all sorts of content to your web site - including photos and videos - there are circumstances when you need to present a group of photos or videos together in a portfolio. If that’s the case, you don’t necessarily need some fancy or complicated content management system. Instead, we can set up pages on your site that act as containers for content that’s stored on external services that you can update whenever you want. What about adding my own content? What is content management? 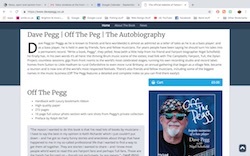 Some people seem to think it’s the ability to completely manage their own web site, adding, removing and editing content, creating new pages, re-jigging the design - in fact, letting rip at everything that visitors see when they land on the site. Here at Hove Web Design, we’re not so sure. It seems to us that content management should be exactly that - the ability to manage defined chunks of content, specified from the outset and integrated seamlessly into the site so that the owner can update the content that’s important to them without having to pay for the web designer’s time, but without disrupting the look and feel and organisation of the site. There are several ways you can do this. add areas to the site that can be edited using a built-in editor accessible from any web browser. In blog entries to come we’ll be looking at each of these in a bit more detail and explain how they work and how they can be used.